This book assesses how coastlines change and how they have evolved over the past few thousand years. It introduces some of the latest concepts in coastal morphodynamics, recognizing that coasts develop through co-adjustment of process and form. The authors examine particular types of coasts--deltas, estuaries, reefs, lagoons and polar coasts--in detail with conceptual models developed on the basis of well-studied examples. In addition to being a text for graduate-level students, this is a comprehensive source for geologists, engineers, environmental scientists, planners and coastal managers. Foreword O. van de Plassche; 1. 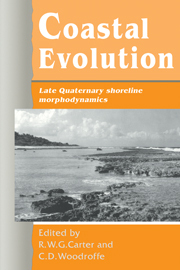 Coastal evolution: an introduction R. W. G. Carter and C. D. Woodroffe; 2. Morphodynamics of coastal evolution P. Cowell and B. Thom; 3. Deltaic coasts J. Suter; 4. Wave-dominated coasts P. Roy, P. Cowell, M. Ferland and B. Thom; 5. Macrotidal estuaries J. Chappell and C. D. Woodroffe; 6. Lagoons and microtidal coasts J. A. G. Cooper; 7. Coral atolls R. McLean and C. D. Woodroffe; 8. Continental shelf reef systems D. Hopley; 9. Arctic coastal plain shorelines P. Hill, P. Barnes, A. Héquette and M. H. Ruz; 10. Paraglacial coasts D. Forbes and J. Syvitski; 11. Coastal cliffs and platforms G. Giggs and A. Trenhaile; 12. Evolution of tectonic shorelines P. Pirazzoli; 13. Developed coasts K. Nordstrom; Index.